It consists of a natural and super-thin Stone veneer (3mm-5mm) and an aluminum honeycomb panel, tightly bonded together through aeronautic bonding technology. (1) Light weight, the standard stone granite marble honeycomb panel weights 16kg per square meter, which is 1/5 of that of the pure stone panel. (2) High intensity and high capability of anti-strike; its intensity is 10 times of that of the 3cm-thick-granite. (3) Good quality of sound insulation and heat insulation. 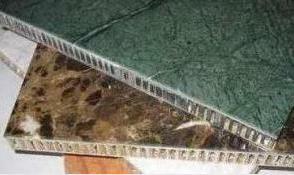 Special size of stone granite marble honeycomb panel can be made as required by the customer.